Access card with redemption code for online Interactive Resource Center included with all new, print copies or can be purchased separately.The online Interactive Resource Center, contains animations, interactive exercises, and other learning resources tied to the book. Edward Allen, FAIA, has taught for more than thirty-five years as a faculty member at Yale University and the Massachusetts Institute of Technology, and as an invited guest at institutions in the United States, South America, Europe, and Asia. 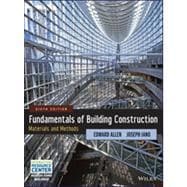 He has designed more than fifty constructed buildings and is the best-selling coauthor of The Architects Studio Companion, Architectural Detailing, Form & Forces, and Fundamentals of Residential Construction, all published by Wiley. Joseph Iano is an author, illustrator, and practicing architect who has taught design and technology in schools of architecture throughout the United States, as well as work in the construction trades. He has collaborated with Edward Allen on numerous publications over the span of more than thirty years. Currently, he heads a Seattle firm that provides technical and quality management consulting to architects and others in the design and construction industry.